In this episode, an invincible enemy has Koji and JP thinking long and hard about the team's identity while Takuya can't wait to barrel into it again. Overused and misused as the episode title's pun is, it's a safe indicator that it's going to be a bad time. Now that Duskmon has decided to jump into the fray, the digidestined are finally forced to grasp the full reality of the situation, acknowledge that the evil forces are, at present, much stronger than what the good guys are capable of handling, and that ignoring this fact is very, very dangerous. Mere weeks after the group was performing high-flying stunts on Trailmon and laughing it up cooking burgers, they find themselves humbled, frightened and more introspective than anyone thought possible. The villain that's so strong that they brush off any and all attacks is a boring, lazy concept. It's one thing if the characters stumble upon the gimmick that's allowing the enemy to shrug off what should be fatal blows, but when a bad guy just doesn't feel like taking damage it's just annoying. The first engagement with Duskmon fits the bill, to the point where just you want it to wrap up and trigger whatever deus ex machina that will allow the good guys to escape. But Piximon isn't flying in this time. Not here. As Takuya persists, Koji calls a hasty retreat and they run the hell away. From there, as tiresome as the invincible villain trope is, the response to it is incredibly thought-provoking. The conflict between Takuya and Koji is not only tense, it actually makes you go back and find inadequacies in previous seasons. 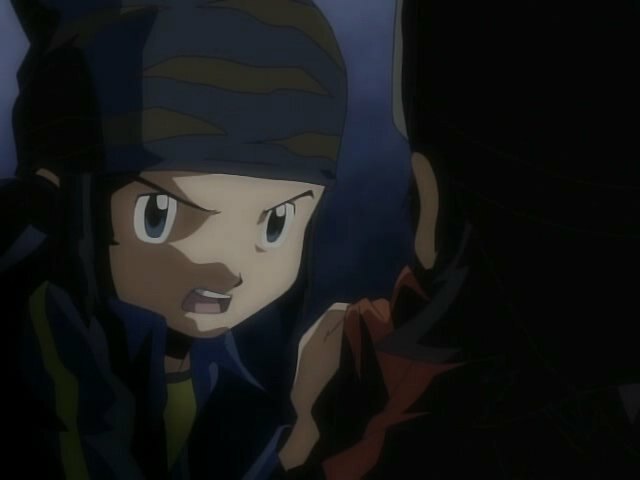 Koji, clearly spooked by his encounter with Duskmon, is determined to avoid him at all costs. Takuya believes persistence will pay off. The argument isn't treading any new territory, but the intensity of it is through the roof. In Zero Two, Tai and Matt allowed Davis and TK to fight in order to get it out of their systems. That mindset becomes apparent when Takuya and Koji don't quite get to throwing punches. They come close, but instead their argument grows more and more heated, to the point where violence would actually be calming. It never happens, because they realize that this situation is far more serious than any schoolyard fight would be able to settle. This isn't one of those arguments where both sides have a good point. Koji's totally right here. 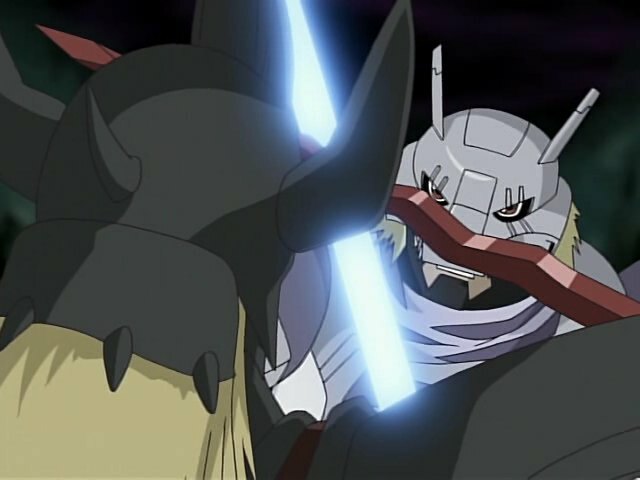 Another futile attack on Duskmon would not only destroy them, but also the entire Digital World. With no chance of winning, why try? The answer, according to Takuya, is that it can't be completely hopeless and that fate will conspire to make sure the good guys win. It's foolhardy logic, but what's frightening is that it's been the cornerstone of the franchise up until this point. There are countless examples of the good guys, up against insurmountable odds, charging in bravely and surmounting them anyway. Koji's common sense not only strikes at Takuya, but every gogglehead that came before him. Yet he's still right. It's the first time believing that the good guys will win has been cast in a bad light. We've touched on the short-sighted heroics Takuya exhibited in episodes 5 and 19 (and Zoe in 16), where he assumed he could be the big hero because he had justice on his side, irregardless of the strength of the opponent. This introduces, in many ways for the first time in the franchise, the reality that the good guys could lose the war, and the consequences of that. It's a sobering thought. 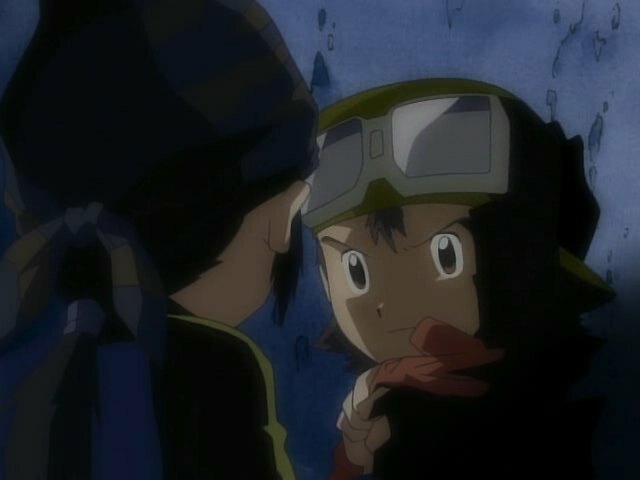 In the end, Takuya lets his instincts take over when Duskmon finds their hiding place. He charges in, loses, and is saved only when KendoGarurumon takes the bullet. The deus ex machina that allows them to escape this? Let's just say it's a little more complicated than Piximon. While this episode was very much about Koji and Takuya, we have to acknowledge JP's very introspective speech. He acknowledges that the two opposite opinions are necessary to maintain some balance in the group. Say what you want about him in action and during social settings, but when he's given time to just sit down and ponder on his own, he's really on top of things. Two Takuyas on a Bridge is adorable, and the slightly chibi style makes it feel like an animated short to interrupt all the darkness. The kids wonder how Duskmon found them. Dude's made of eyeballs! Duskmon and Velgemon were so cool. 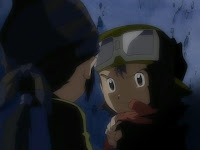 A real shame Koichi didn't get to keep them as his Digimon forms.